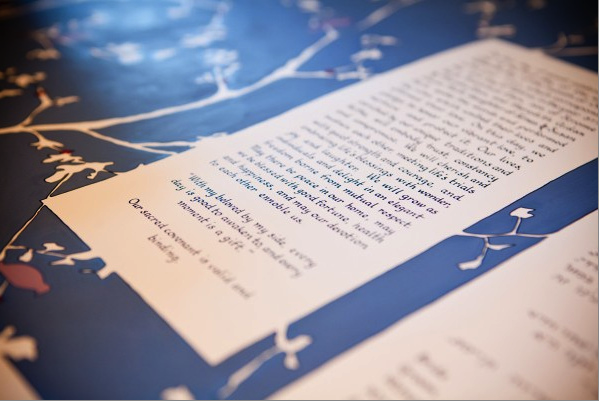 Cara– the ketubah is absolutely amazing– we will treasure it for years to come. Thank you so much! We could not be happier. It looks great. We are very happy. Thanks for your gorgeous work! The ketubah arrived and it is unbelievable! You are so talented. We love it. It looks great. It is GORGEOUS!! Thank you so much. Wow. Cara, this is amazing. LOVE it. The ketubah is now hanging in the most prominent spot of our very small studio apartment. We had it beautifully framed and the framer said it was the nicest ketubah he has ever seen…a true work of art!!!! Thank you again for making one of the most significant parts of our wedding celebration! It has been lovely working with you! Thank you for being so flexible and patient. Your work is absolutely beautiful and I will be sure to recommend you to friends who will be in need of purchasing a ketubah in the near future. The ketubah arrived today and looks great. Thanks for your great work on this! We just arrived in Turks & Caicos and opened the Ketubah and it’s ABSOLUTELY gorgeous – the design and text are impeccable. It came today, and it looks beautiful!! Thank you so much! I got it and we absolutely love it. The Hebrew brought tears to my eyes it was so perfect. Really powerful and you put so much love into it. Thank You!!! I’m obsessed! Thank you! I LOOVED working with you!